This salad is as pretty as it is tasty. I try and grow edible flowers in my herb garden each year to decorate salads such as this one. Serve with crisp, Italian bread. Cut the goat cheese cylinder into 12 equal sized rounds, pushing into shape with your fingers as necessary. Roll each disc into the bread crumbs, and place them on a baking sheet lined with aluminum foil. Refrigerate until ready to serve. Arrange the greens, tomatoes and onions on four individual plates. Mix the vinegar, oil, mustard and salt and pepper together until well blended. Turn on the broiler, and place the baking sheet with the goat cheese rounds under the heat. Cook for a minute or two until the cheese rounds are slightly golden and bubbly but still holding their shape. 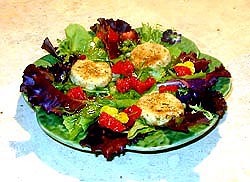 Arrange three goat cheese rounds on each salad plate, and then drizzle with the dressing. Serve immediately.